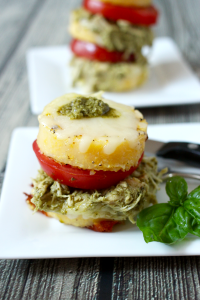 Pesto chicken polenta stacks make a delicious 10-minute dinner! Sometimes in the summer, which gets rather hot and humid here in North Carolina, I cannot fathom cranking up the oven or standing over the stove. And other times, we’ve lingered at the pool or playground for a little longer and I’m pressed for time. Yet I still want to feed my family and make us a delicious homemade dinner. Presto pesto! 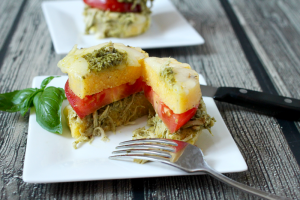 These pretty little polenta stacks are ready in 10 minutes and they are packed with flavor. Pesto will do that to a dish. Before I continue though, have y’all heard of Yummly? It’s a site that lets you search for recipes based on your personal taste preferences. You tell it what you like – and don’t like – and it’ll give you recommendations, shopping lists and more. Seriously smart. You can also search by holiday, cuisine, diet, nutrition, allergy, cook time, ingredient and more, so you’ll always find some foodie inspiration. And you can organize your recipes into collections (kinda like Pin boards) so you can easily find your favorites. The more you Yum, the better tailored it will be for you. 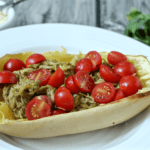 Check out my page and then register – it’s totally free – and start exploring some awesome recipes! And don’t forget to Yum your favorites here, too! 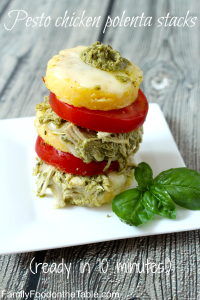 OK, back to these pesto chicken polenta stacks… I classify these as a definite fun food. I like to get a little silly, stacking them up so high. Makes my kids laugh to try to make them lean and finally topple. You’ll need to disassemble a bit to have a prayer at cutting through it cleanly. 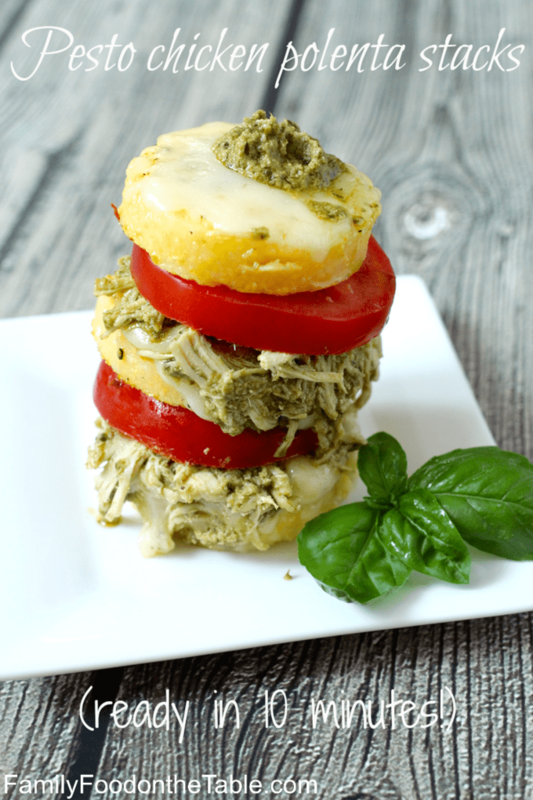 And even if your stack slips and you end up with a mixed plate full of polenta, pesto chicken and tomatoes, you still win at dinner. J is not quite 2, so his plate always looks like that and he doesn’t seem to mind. I’ve always got these ingredients on hand and it’s easy to throw together any night. So go ahead, stay outside a little longer this summer. Dinner will be a cinch. 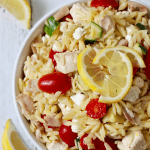 Easy ingredients come together for this delicious 10-minute dinner! Heat a large saute pan over medium heat. Add 1 tablespoon olive oil. Add polenta slices in an even layer and cook 3-4 minutes. Carefully flip polenta slices. Sprinkle with salt and pepper and top with mozzarella cheese. Cook another 2-3 minutes, until the cheese is melted. Remove your polenta slices to a paper towel to absorb some of the excess oil. Meanwhile, stir the pesto and shredded chicken together until everything is well coated. If you prefer, you can throw the pesto chicken into the pan after the polenta cooks to warm it up a bit. Sometimes I do that, sometimes I leave it cold. To serve, top a cheesy polenta round with a heaping scoop of pesto chicken, followed by a tomato slice. Repeat, building each stack as high as you like. You’ll probably have some leftover pesto chicken. I try to at least. 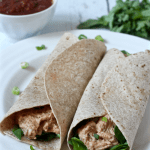 It’s great stuffed in a wrap the next day with some chopped tomatoes and spinach leaves! 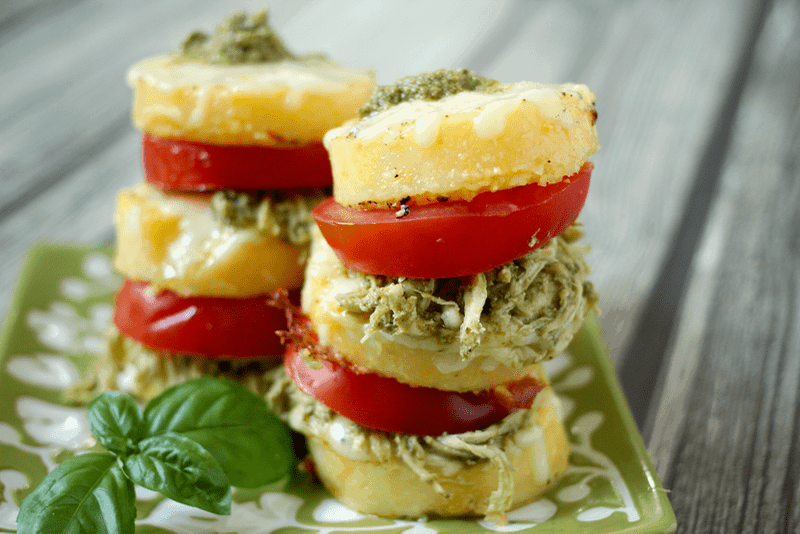 You can also serve these polenta stacks as a fancy appetizer or part of a buffet spread for a party. You can cut them in half and stick a toothpick through them to make them easier to handle (and to double the amount). They will surely go quickly! ** What’s your favorite dinner to (not really) cook on a hot summer night? This looks so delish! Pesto and polenta sound like a killer combination! Thanks for sharing. I can’t wait to make this! What a creative idea and delicious too! 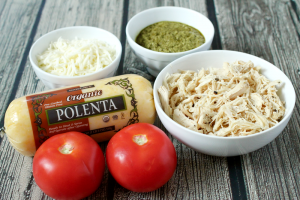 We are pesto crazy here…I make it all summer long and freeze as much as possible! Can’t wait to try this!